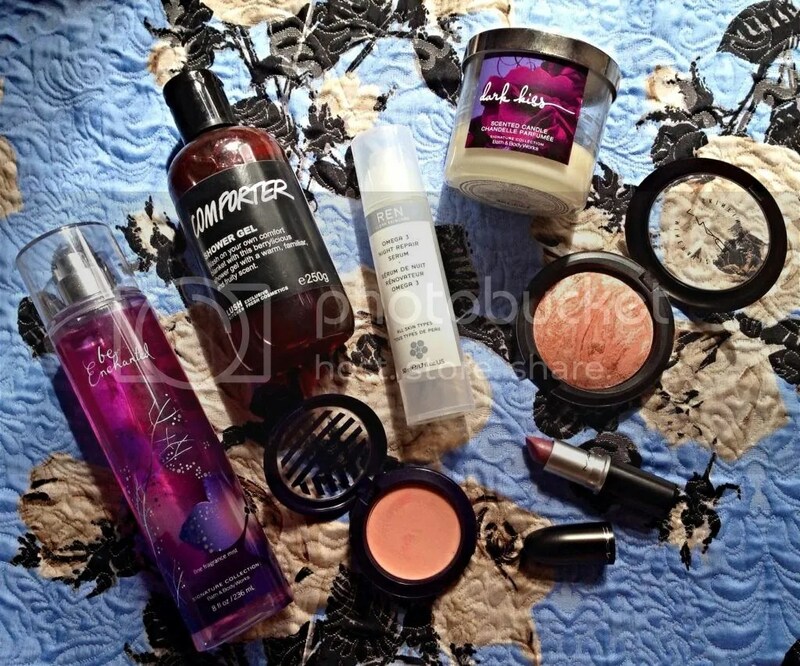 August Favourites | Becky Alyssa's Beauty Box. It’s already nearing the end of summer – it’s gone too fast! Hope you’ve had a wonderful month and have been enjoying the cooler weather. What have you been loving this month? 1. Bath & Body Works Be Enchanted Fragrance Mist ($14 via Bath & Body Works) – I can’t believe I haven’t mentioned this before – it’s my all-time favourite scent to spray on for a lazy day, or when I can’t decide what fragrance I want to wear. I’m not a fan of their lotions as they are so overly scented, but the fragrance mists are much more subtle and refreshing. ‘Be Enchanted’ doesn’t seem to be a popular choice with everyone, but personally I love it – a deliciously fruity pomegranate & passionfruit burst with more subtle floral notes of violet and honeysuckle, amongst others. Unique and delicious! Not to mention my lovely aunt uses other Be Enchanted products in her bathroom, and whenever I use this it reminds me of her! Can’t wait to visit the US again so I can stock up. 2. Lush ‘The Comforter Shower Gel (no longer available) – I may be a sucker for limited edition products, but this is by far the most gorgeous-smelling (and brightest) shower gel ever! No exaggeration. I managed to purchase one via the Lush Kitchen a few weeks ago when a limited batch was released, thrilled I managed to get hold of one before they sold out. Anyway, fans of the Comforter bubble bar need this in their lives – it has the same distinctive and divine blackcurrant and bergamot scent, but in a brighter, more liquid and shower-friendly incarnation. A devastating shame that this isn’t permanent – we can only dream! 3. REN Omega 3 Night Repair Serum (£23 via REN Skincare) – Despite using this serum for a year or so, this has only recently become one of my favourite, can’t-live-without products. I’d been using lighter skincare during our heatwave weather, but now it’s a bit chillier I whipped this one out again! I use a pump and a half every evening under my moisturiser, and even after only a couple of days of use this made a huge difference in the appearance and texture of my skin – it looks and feels smoother, brighter and more well-rested. Note that it’s recently been renamed and repackaged, but still the exact same product. Suitable for all skin tones, though anyone with oilier skin would get best results using this every other evening instead of every single night. Winter weather, I’m ready for you! 4. Bath & Body Works Dark Kiss Scented Candle (no longer available) – I spotted this on Ebay for a bargain price, and despite the fact that it smells more like a perfume than a home fragrance, it’s now one of my favourite candle scents of theirs. Shame it’s no longer available, as I’m so close to using it up! And there’s no chance of me getting hold of it again, since the only one available is nearly $50 before postage on Ebay USA. Before this turns into the limited-edition-sadness post, I do have to say I’ve really enjoyed the unusual but delectable dark berry and vanilla scent and hope this gets re-released in future! And what’s the point of owning limited edition products if you’re too scared to use them up and enjoy them? The only issue I have with this is that these medium candles as well as the smaller ones seem to tunnel – they don’t burn evenly and I end up having to use my makeshift ‘foil sleeve’ (tinfoil wrapped around the candle leaving space for the flame) to distribute the heat evenly – not ideal but helps when you’re trying to use them up well! However all the mason jar and 3-wick B&BW candles I’ve had have burned wonderfully. 5. MAC Mineralize Skinfinish in Stereo Rose (no longer available) – Some might say I have something of a MAC addiction lately, not helped by finding so many great and affordable sold out products of theirs from lovely sellers on Depop – check out the app if you haven’t already! I got hold of this practically new Stereo Rose MSF for just £17 including postage, a limited edition favourite from the Fantasy of Flowers collection earlier this year. 2012 also saw the release of a Stereo Rose, but in a more pigmented pink-coral incarnation than this peachier shade. Despite general disappointment from long-time MAC fans, this newer coral shade features a fine gold sheen which when swiped across cheekbones looks divine – a must-have blush/highlight in one that would suit a variety of skin tones. I’ve worn this several times already – it’s so flattering on pale skin and doesn’t look glittery. Perfect for anyone like myself who skips the highlighting step in their routine – products like this do all the work for you! 6. MAC Powder Blush in Launch Away! (no longer available) – Another impulse Depop purchase! I got this for £7 including postage, as quite a bit had been used already. After sanitising it with my Pro Hygiene Antibacterial Makeup Spray, it was all ready for me to use. I was a bit disappointed when it arrived since it looks almost flesh coloured in the pan and doubted it would even show up on my skin, yet when this is blended into the cheeks and built up a little it transforms into a really gorgeous, flattering peach-pink with a lovely satin finish that lasts all day. This would suit all pale skin tones as a light, everyday blush which would go with everything. Shame I missed out on the stunningly packaged Hey Sailor collection first time around, but you can always pick up some pieces via Depop or Ebay for fair prices! 7. MAC Lustre Lipstick in Syrup (£15.50 via MAC Cosmetics) – Am I the only one who hesitates to use brand new, pricier makeup items? As much as I enjoy savouring a brand new lipstick, we buy makeup to actually use it – not as an expensive decoration! And Syrup is my current favourite which I’ve finally broken in after buying it months ago – the Lustre formulas deliver a buildable, non-drying wash of glossy colour which flatter just about anyone. I find most of the Matte and Amplified formulas are too drying or clashing to wear regularly, so I’m always reaching for the Lustres and Cremesheens! Syrup is a hard-to-find but easy-to-wear muted pinky-mauve shade, making it perfect for everyday wear and one I’ll always reach for as a tried-and-tested favourite. Those are all my favourites for August! Will September finally be the month I get over my MAC / limited edition obsession? Who knows! What products have you been loving and reaching for this month?